The digital revolution has changed the way we shop; we go online to research prospective purchases, use social media to find out what others think, and use our mobile devices in-store to make better informed choices about the product we want, how much it costs, and how we want to receive it. Today we expect retailers to know who we are, where and how we are shopping, and cater to our specific likes and preferences. And wearable technology is set to take these expectations to another level. Wearables are the next big wave to hit retail, and retailers looking to stay ahead of the curve now face the challenge of understanding how to design in-store and mobile services that leverage the power of mobile APIs to create new experiences and make life as easy as possible for shoppers. Because wearables are no longer a fad – they’re going mainstream. As the recent DigitasLBi 2015 Connected Commerce study of retail trends reveals, international shoppers expect an omnichannel, multi-screen experience from brands and retailers, with the average consumer now using a total of five devices when making a purchase. The research shows that as well as computers, smartphones, tablets and smart TVs, consumers are rapidly embracing wearable technologies, with 17% of shoppers revealing they already own a wearable device – and that was before the launch of the Apple Watch. Wearable tech will alter retail as we know it. According to industry analyst Gartner, the take-up of wearables will escalate with smart watch shipments alone predicted to hit 10 million in 2015 and 60 million by 2016. Wearables will usher in a new level of hyper-interconnected retail in which retailers ‘join the dots’ between an individual’s pre-store and in-store behaviours to deliver an enhanced customer shopping experience. By leveraging the power of mobile APIs, retailers will enable more real-time input into purchasing decisions and deliver highly personalised offers and solutions, which according to the DigitasLBi 2015 Connected Commerce survey is exactly what they want – 62% of respondents confirmed they buy more – and more often – when met with personalised retail experiences. As stores sync with a shopper’s wearable device, they’ll be able to use shopping histories and personal preferences alongside social trending data to deliver an even greater hyper-personalised experience that’s more agile, digital, experiential and more connected. The opportunities for retailers are extensive – from serving up contextual information like in-aisle navigation and instant price comparisons, to gathering big data analytics that enable further enhancement of the shopping experience and deliver the highly customised benefits today’s consumers hanker for – convenience, targeted offers and vouchers, on-the-spot pricing and rewards like loyalty points, product recommendations, ‘wish list’ incentive offers and notifications. As well as curating the experience to each shopper, retailers could also use payment, voice and social media APIs to facilitate payment processing anywhere in the store. Shoppers with wearable devices could look at a product and scan its barcode or use an app to verbally request to buy it – and opt to collect in-store or request a home delivery. All of which minimises the need to queue, and offers the potential for introducing innovative new ways to transact with brands and retailers. As the DigitasLBi research shows, 62% of smartphone users confirmed they would happily use their devices to pay in-store. With the launch of Apple Pay in the US and a growing number of start-ups in the in-store payment arena, 2015 could be the year mobile payment truly takes off, fuelled in part by wearables. Retailers now have an enormous opportunity to collaborate with brands and other partners through wearable tech and this will ultimately offer new monetisation opportunities that change shopping habits. 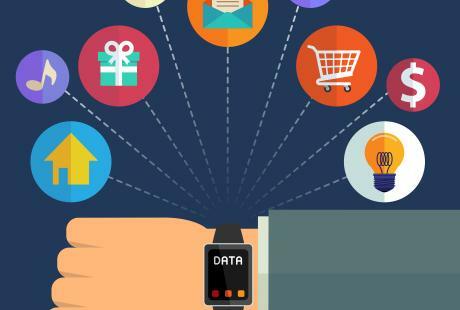 From interest-specific content or advertising that showcases products to activity-based engagement that’s contextually relevant to shoppers, wearable devices represent a meaningful opportunity to drive sales and eCommerce. The partnership landscape is likely to radically change as retailers look to collaborate with brands to boost in-store merchandising or open their APIs to generate exciting new services that boost footfall and sales or extend the traditional e-commerce experience. Products and services that allow today’s connected consumer to act on impulse are proving increasingly popular. As the DigitasLBi 2015 survey reveals, customers want to save time and money, but have a choice in how they shop. Wearables offer one more screen for customer interaction, and if retailers and brands can offer a seamless experience across all interfaces they will be sure to make a mark. They need to ensure their apps are optimised for wearable devices and deliver a differentiated experience that does more than simply replicate offers on a smartphone. The demand for convenience means wearables are likely to bolster mobile payments and offer new opportunities to engage more closely with customers – with mobile payment apps that give users the option to redeem exclusive offers and coupons or earn loyalty points and rewards. But perhaps the greatest opportunity for retailers is the growing willingness of consumers to share their personal information – including their happiness levels – with brands in exchange for rewards. All of which gives retailers, and potentially their API partners, access to rich data sources that enable the enhanced personalisation that has a real impact on purchasing behaviours. The challenge now for retailers is how to design in-store and mobile services that leverage the power of APIs – initiating new collaborations that boost in-store merchandising and deliver highly curated consumer services.